Not every pair of athletic socks is created equal. Wigwam knows this, and they’ve known it for a long time. The Wisconsin-based business that began as a knitting company had a rough start in 1904, but their perseverance is what made them so successful. The Sheboygan Knitting Company was destroyed by a fire, but Herbert Chesebro and a group of investors decided to salvage what they could. The Hand Knit Hosiery Company was born, and they started producing huge quantities of products. 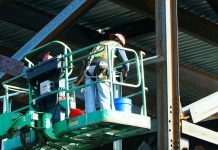 When most people would probably call it quits, the company we now know as Wigwam would not exist without the efforts of these hardworking people. By 1924, Robert Chesebro, Sr. (Herbert’s son), joined the company. Wigwam Knitting Works was a proposed name change, but this didn’t get altered until well after Robert Sr. took over in 1932. They made socks, hats, gloves, sweaters (for people and dogs! ), and scarves, too. The sock company strived to improve their products, as they still do today. They began working closely with the DuPont Chemical Company to make their revolutionary new synthetic fiber – nylon – better. Your hiking and running socks are more advanced, thanks to the innovations that happened over 70 years ago. Chesebro, Sr. developed wool socks that were knit with a closed toe seam that corresponded with the sock’s size. It’s a simple concept, but a genius idea! For families with several different sizes, this made sorting all the socks much easier. This helpful trend is still used today. 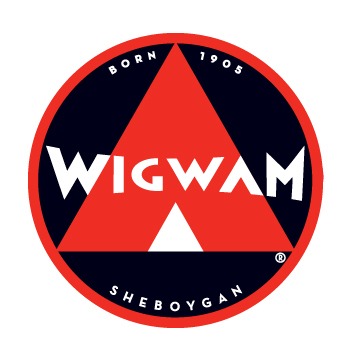 The company’s name was officially changed to Wigwam in 1956, and the registered trademark dates back to the original acquisition in 1905. Robert Chesebro, Jr. joined Wigwam in the 1960s, and in addition to keeping the business in the family, he brought new ideas for outdoor and athletic lines. Since Wigwam socks’ production needed to expand due to increased success, they bought 16 acres of land in Sheboygan Industrial Park. In March of 1970, construction began on Wigwam Mills, which is where they’re still located to this day. Robert Chesebro, Sr. was even inducted into the Sporting Goods Hall of Fame. His profound leadership, innovation, and brand promotion within the sporting goods industry have kept Wigwam in the top of the market. The design of wool socks has changed over the years. Wigwam has been open to new ideas, and that’s what has helped them stay ahead of the competition. During the 1980’s, a more modern and simple design was implicated. Just because the women’s and men’s socks appear basic, their technologies are what makes them so great. Wool socks were knit with cotton to reduce itching. Further experimentation in the ’90s, including the creation of Ultimax Moisture Control System and Dri-Release (you can discover more about these technologies within work socks at Working Person’s Store), helped develop Wigwam even more. They provide the world with the highest performance socks possible. Today’s crew socks work hard to keep your feet cool. CoolMax, another Wigwam technology, has moisture-wicking capabilities. Heel and forefoot pads are also found in some to prevent blisters and irritation. Nylon and polyester, paired with sweat-drying technologies, create athletic socks you can truly depend on all day. Wigwam creates their USA-Made socks to do more than just cover your feet. They protect, comfort, and provide you with the superior athletic designs you need. With over 100 years of production, they’ve more than proven they really do know what they’re doing. Get your pair of Wigwam socks today! 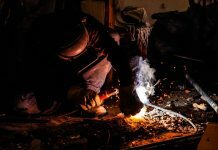 Next articleGrundens: Making Your Work Life Drier!